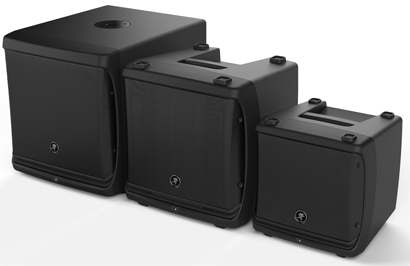 Mackie has announced a new line of ultra-compact, powered loudspeakers - the DLM Series. Packed with cutting-edge technology, DLM speakers each feature a staggering 2000 watts of power, proprietary Mackie TruSource technology and a full-featured integrated digital mixer/processor. Each DLM Series Powered Loudspeaker delivers 2000 watts of ultra-efficient Class-D power. Featuring TruSource™ technology, the full-range DLM8 and DLM12 are equipped with Mackie’s TruSource driver that incorporates the high-output woofer and 1.75” compression driver into an incredibly compact common-magnet design. Powerful TruSource DSP delivers seamless clarity, consistent dispersion and unmatched fidelity. Both the DLM8 and DLM12 feature the Mackie DL2 integrated digital mixer, providing a dual-channel mixing solution for a wide array of possible connections with incredible channel features like 3-band EQ and 16 great-sounding effects. Plus, system processing like a multi-band feedback destroyer, six speaker modes and Smart Protect technology provide the tools needed for truly professional applications. The ultra-compact form factor of the DLM8 and DLM12 includes a rugged PC-ABS cabinet, powder-coated grille and integrated kickstand for personal monitor use. The companion DLM12S packs 2000 watts of chest-pounding power and deep low end into the highest-output compact sub on the market. The integrated DLP Digital Processor provides system processing tools like a variable crossover, speaker modes for optimum voicing and the system protection. The rugged 15mm poplar cabinet is unbelievably compact with a durable, powder-coated grille and integrated pole-cup for mounting a DLM full-range loudspeaker plus additional configuration options that include wall mounting and flying for professional installs. Mackie DLM Series 2000W Powered Loudspeakers will be available in Winter 2012. The DLM8 will have a UK RRP of £699 inc vat, the DLM12 will have a UK RRP of £799 inc vat and the DLM12S will have a UK RRP of £999 inc vat.